A day without tennis probably wouldn't kill you, but why risk it? 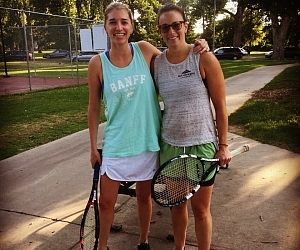 If you like playing tennis and being social, this league is for you! Play a combination of singles and doubles any given week - up to you and your team! The overall winner is the team who wins the most sets. Team tennis scores 1-2-3-4=Game. There is no ad/deuce scoring. At 3-3, the receiver of the serve chooses which side they wish to receive the serve and that point ends the game. Sets are won to 6 games and can end 6-5. League play is 90 minutes and we play 2 sets of coed doubles, 2 sets of singles and 1 set each of mens/womens doubles. This program is from recreational to about a 4.0. If you are higher than a 4.0, the games might be boring to you but the socializing aspect could be great! This is SOCIAL and TEAM tennis! We want to make clear that we DO combine skill levels to create new teams. You can join up with players above and below your skill level for each individual game. We hope that by the end of the season you will have increased your skill level as a player in addition to making great new friends.